The Andy Warhol Museum wanted a unique approach in proving to new and returning customers that each visit to The Warhol offers an exciting experience. The Warhol’s By the Book exhibition is a great example. It provides a surprising look into Andy Warhol’s creativity and his ideas about art through works that defy and question the common notion of what a book can be. 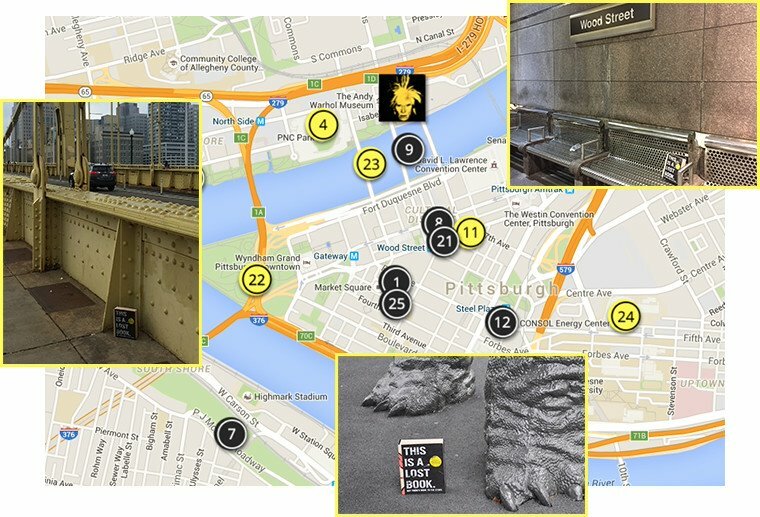 More than 150 specially-designed books were hidden throughout the city of Pittsburgh over the course of two months. 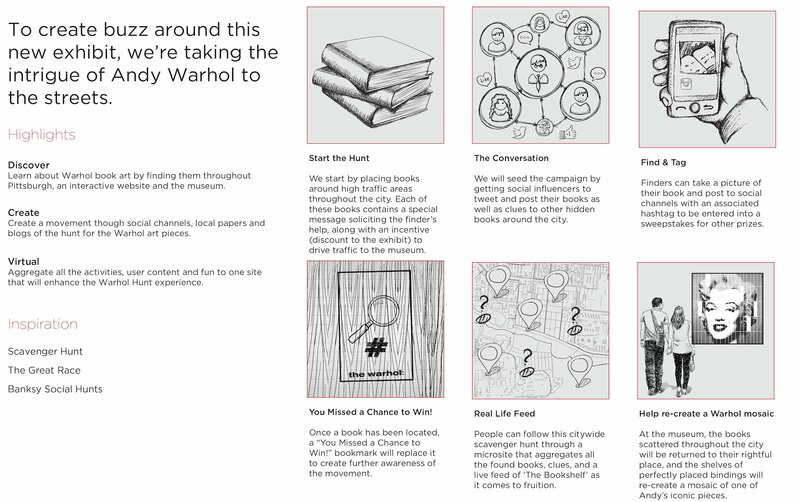 When discovered, each book invites the finder to return it to the Andy Warhol Museum to collect a reward. As the books were returned to the museum, they were placed on a large bookshelf installation. With every book in its rightful place, the spines of the books recreated an image of one of Andy’s Warhol’s works featured within the exhibit. WarholBookHunt.com: a microsite dedicated to the book hunt was created to provide clues and track each book as it was found. Book hunters were encouraged to post photos of their discoveries using #warholbookhunt. On certain days, geo-specific mobile-only Facebook ads alerted users when they were within one mile of a hidden book. 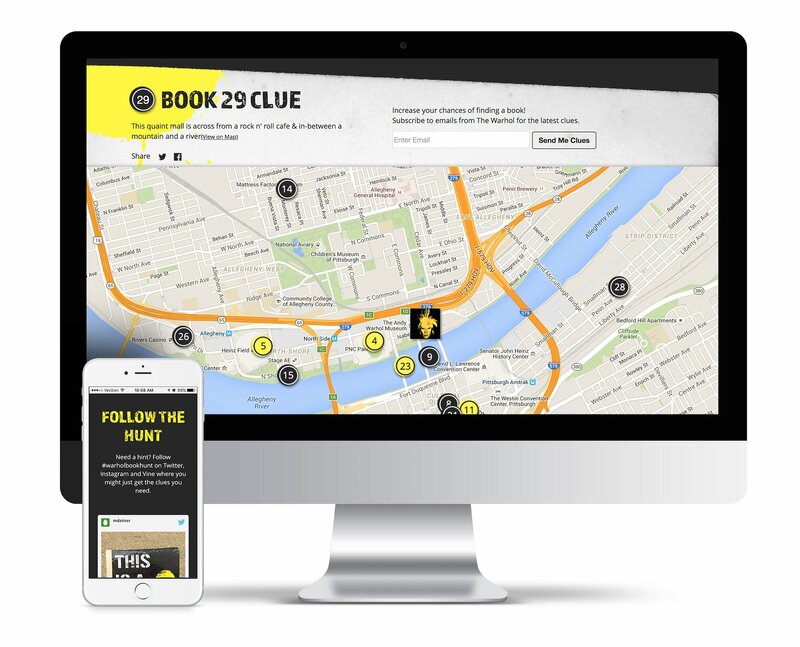 The ads included a map to the book’s location as well as its corresponding clue. 42% Increase in the month of December, admission from the previous year. The hashtag #WarholBookHunt has reached over 10 million people organically since the launch of the campaign on 11/1 with over 2 million additional people reached via paid Facebook ads.